This type of copies used to be called "Xerox copies" and the industry used to be known as xerographic copying at the time when black and white copying became available. 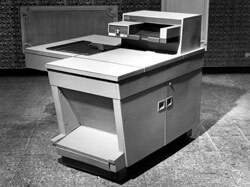 In 1959 Xerox introduced the first plain paper photocopies with their Xerox 914 copier, that revolutionized the document-copying industry. At the time, it was fast and economical when compared to other reproduction options. One of those printers (which weighed 648 pounds) can be seen at the Smithsonian Museums. The maximum printing size was 9" x 14" and every now and then, the machine caught fire due to overheating. Those copies where pale, had a tint all over the page and did not reproduce details with enough clarity. In 1949 Xerox had introduced their Xerox Model A that required special papers (see picture on the left). The regular paper printing was a big breakthrough. Significant progress has been made since those early days in the black and white printing technology, permitting nowadays black and white copying with quality that challenges that of offset printing (considered the most perfect printing technology still for long run printing). Saturn Printing and Marketing has enormous capacity to print and deliver that ever important to you on time and within budget. The use of color increases understanding and retention of printed material by an average of 65%. Your presentations, flyers and posters speak for you wherever they go and color makes you look like a pro. It brings your ideas to life and underscores the quality of your products or services.